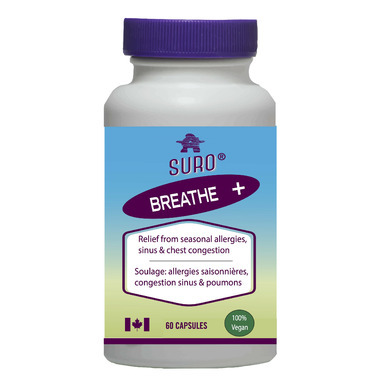 SURO-BREATHE+ capsules is a herbal remedy that helps to clear the air passages and improve breathing. Great for relief from seasonal allergies, asthma, sinus and chest congestion. Used in herbal medicine to help relieve symptoms of seasonal allergies. Used as an expectorant to help relieve excess mucus of the upper respiratory passages and to help relieve the symptoms of bronchitis and catarrhs of the upper respiratory tract. Dosage: Adults take 3 capsules, 4 times per day. Ingredients: Marshmallow 33,33 mg, eucalyptus 66,67 mg, ginseng 1,25 mcg, plantain 25 mg, rosemary 0,8333 mg, sage 4,17 mg, elder flower 62,67 mg, thyme 33,33 mg, fenugreek 50 mg, nettle 100 mg, mullein 33,33 mg, aniseed, cinnamon, elderberries, juniper berries, spearmint, green tea. Caution: Do not use if you are pregnant or breastfeeding. Consult a health care practitioner if symptoms persist or worsen. Discontinue use and consult a health care partitioner immediately if dizziness, mental confusion, weakness or muscle pain, irregular heart rhythm and/or difficulty breathing. Do not use if you have a heart disease, kidney or liver disease, high or low blood pressure, diabetes or edema or if you are taking products containing diuretics. Hypersensitivity or allergy may manifest. If this occurs, discontinue use in case of gastrointestinal upsets, such as abdominal cramps, nausea, vomiting, diarrhea . Diuretic effect may occur. Do not use if you have a seizure disorder.